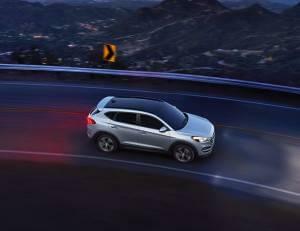 Whether you’re running errands around the city or planning a getaway, the 2017 Tucson is your sidekick to living life! 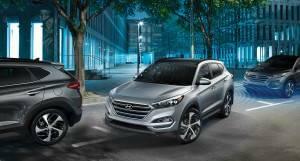 Take a tour of the 2017 Tucson and explore the features. Re-engineered to deliver sporty dynamics and designed with versatility in mind. 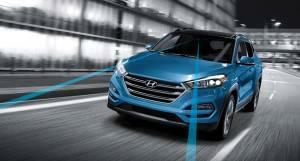 The 2017 Tucson is filled with what you’re looking for, like the available panoramic sunroof or advanced safety features such as the available Autonomous Emergency Braking. The available All-Wheel Drive (AWD) system delivers 100% of torque to the front wheels during normal road driving and can automatically send up to 50% to the rear wheels, depending on conditions. The system includes a driver-selectable AWD lock that allows a differentiated torque split between front and rear wheels, for off-road and extremely slippery road conditions. The system also includes Active Cornering Control (ACC), which automatically transfers torque to the wheels with the most traction. The system reduces understeer and enhances cornering performance by braking the inside rear wheel and delivering more torque to the outside rear wheel, providing a torque-vectoring effect. 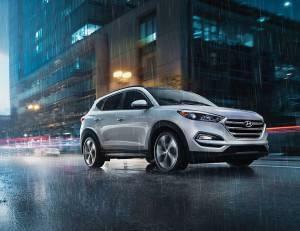 The all-new Tucson offers the standard 6-speed automatic transmission with the 2.0L engine. This standard transmission includes a Shiftronic™ manual shift mode and an overdrive lock-up converter for improved fuel economy at highway speeds. 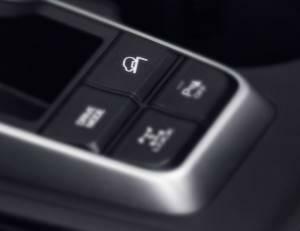 For even more enhanced fuel economy, step up to the advanced, first-in-class, 7-speed dual-clutch automatic transmission. Paired with the 1.6L turbo engine, its direct connection to the engine improves overall efficiency, eliminates interruption of torque between shifts, and provides an optimal balance between fuel economy and performance. 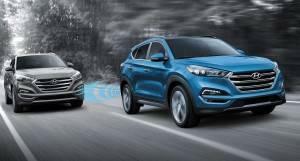 Those who seek high levels of driving efficiency will immediately love the available engine options in the all-new Tucson. 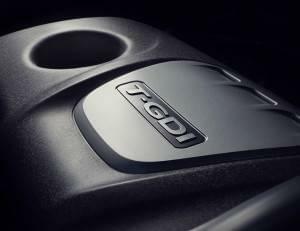 Choose between the standard 164 horsepower 2.0L Gasoline Direct Injection (GDI) engine, or the all-new 1.6L Turbocharged GDI engine. It delivers a powerful 175 horsepower, 195 lb-ft of torque and is mated to a 7-speed Dual Clutch Transmission for optimal performance. 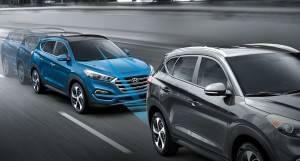 Hillstart Assist Control detects inclines and helps prevent the Tucson from rolling back in the moment between braking and acceleration, while Downhill Brake Control helps you maintain a consistent speed while travelling down a steep hill in slippery conditions. 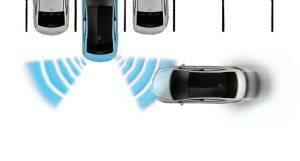 The available Autonomous Emergency Braking function uses a forward camera and radar sensors to detect rapidly closing speeds to the vehicle ahead, providing warning notifications to the driver of potential forward collisions. 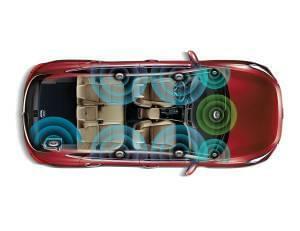 At speeds under 80 km/h, the system can provide full braking assistance to help avoid a potential collision. Blind Spot Detection (BSD) uses radar to detect when a vehicle is in the driver’s blind spot and provides both an audible and visual alert to help keep you aware as you drive. Working in conjunction with BSD, Lane Change Assist measures the closing speed of traffic approaching in adjacent lanes to help determine if a lane change is safe. 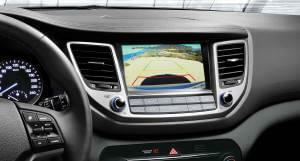 Activated during reverse driving, the available Rear Cross-Traffic Alert system uses radar to help identify and warn the driver of vehicles approaching from the side, even before they come into view of the standard rearview camera. The standard rearview camera and available rear parking assist sensors provide additional guidance and information for added ease with parking and reverse driving. 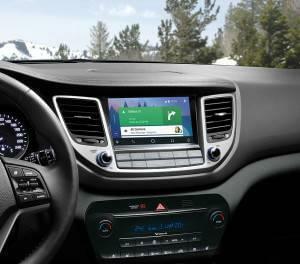 The available Apple CarPlay™ adds to the 2017 Tucson’s advanced technology. This much-anticipated innovation integrates the features of your iPhone® and select apps through the available 8” touch-screen navigation system. 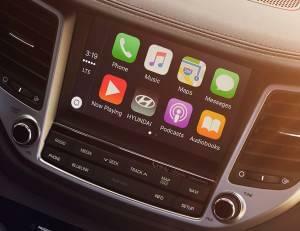 Apple CarPlay™ support is also included on 2017 Tucson models – there is no separate charge for it and no software update is necessary. The available premium audio system with SiriusXM™* includes an external amplifier and 8 speakers strategically placed inside the cabin to provide equal listening pleasure – offering an immersive, surround sound experience for all occupants.